Sottle analyses the state of the new Standard format. Flamewreathed Faceless can give Shaman players a 7/7 on turn 4. Whelp! Simon ‘Sottle’ Welch is a multi-Legend rank player on team compLexity, tournament winner, and caster who regularly streams on Twitch. He also writes guides for Icy Veins, all while finding time to be a national Yo-Yo champion. Unless you’ve been chained to a rock deep below a lavish fantasy kingdom, you’ve probably already been overwhelmed by card predictions, set reviews, and bold statements of fact about what the Whispers of the Old Gods meta will look like. Hearthstone pros, personalities, and content creators have all had their say about which cards would be strong, which would be unplayable trash, and what the new dominant decks are going to be. Talk is of course famously cheap, and after all the buildup we’ve now had a full week to see what the brave new world of Hearthstone Standard actually looks like. Here are seven lessons we’ve learned so far. Who knew, eh? Ok, everyone. More out of hope than expectation, I slapped together a Face Shaman deck in the first minutes of the new expansion going live to see if there was some magical reason why playing a 7/7 on turn four was not criminally unfair. 10 games and nine wins later, I decided there was literally no such reason, and moved on to actually having some fun. The power cards that Shaman have been given aren’t just confined to aggro either, and have opened the door to the class becoming an all-round powerhouse. Loyan, a Shaman specialist who formerly went by the name of 11point5ft, reached Rank 1 Legend rank using a board-focused Midrange build, and decks built around the new evolution effects have also been successful. Doomhammer is the old card that makes a lot of these strategies possible, and also a card that was widely predicted to be part of the wave of nerfs Blizzard made just before the arrival of Standard. It remains to be seen whether Team 5 will take a more proactive strategy to balancing cards in the future, and while it’s too early to be crying for nerfs just yet, Shaman is definitely high on the list of things that will need to be monitored. One of the hottest topics as the cards from the new set were revealed was whether or not the meta would be slow enough to support running 10-Mana minions, or whether they would sit lonely and stranded in your hand as you sat absorbing damage from an endless flood of Wolfriders (and 4 Mana 7/7s). The good news for those of you that love the feeling of big power cards is that it seems that at least two and a half of them are viable. C’Thun decks are doing work on the ladder. Much like Dragon decks after The Grand Tournament came out, there is still experimentation to be done in order to find the class that fits each god best, but it seems like at least one C’Thun deck will stand the test of time. Much of the early action centred around Druid, because the two C’Thun synergy class cards are so good, but Warrior’s ability to stall might make for a better shell—check out this list which Sjow is working on. N’Zoth is also performing strongly in Rogue and Paladin, summoning ludicrous board states from out of nowhere. Yogg-Saron is the half-viable one, with players running him in spell-heavy decks as much for entertainment as effectiveness. 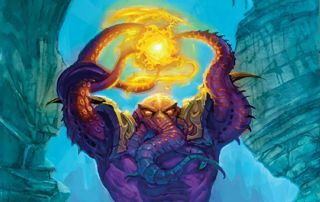 Inconsistency was the initial fear, but from what’s been seen so far Yogg’s consistency is more of a problem— we know that Yogg will generally draw a bunch of cards, play Secrets, and kill himself, the board, and sometimes you. Y’Shaarj is the black sheep of the betentacled family for now, because his effect is less destructive than the other Old Gods, though Lifecoach is experimenting with him in a super greedy ramp Druid list. Rogue got one of the best class legendaries of the new set. Many pros, who tend to favour Rogue for its high skill cap, felt hard done by the unexpected nerf to Blade Flurry, but the class has emerged as one of the success stories of the early Standard meta. The loss of Blade Flurry has forced Rogue to play more for board control with creatures, but they have a bunch of new toys to do that. Shadowcaster and N’Zoth have opened up a new Deathrattle-focused build that is capable of creating absurdly strong board states by recycling sticky minions. On top of this Xaril, Poisoned Mind has increased the overall power of Miracle Rogue decks with a variety of win conditions. I shudder at the thought of a deck with all these options still having access to one of the most powerful board clear effects in the game, especially in the absence of so many of the old sticky Deathrattle minions. In hindsight it seems that the nerf to Flurry has opened the door for a class that was fairly one-dimensional to finally have more ways to play. Malfurion may have felt like it was finally his time. Once ostracised and isolated, the victim of hatred and vitriol from all corners of the Hearthstone community, old greenbeard has returned to Standard a reformed man having finally shed those trouble-making charging Treants. Well, surprise! Everyone still hates you! This is mostly due to leftover ill will towards Combo Druid than a genuine reaction to the C’Thun and Beast-focused decks that are being played now, but facing Druid can still be a frustrating experience. The continuing presence of Wild Growth and Innervate means that Druids are still able to ramp out ahead of the Mana curve and create oppressive board states much earlier than you’re able to deal with them. Then there’s the added delight of the occasional game where you queue into an Astral Communion Druid who of course has Innervate and Astral Communion into Y’Shaarj roughly 100% of the time. Druid will stabilise over time, and it may still end up being the eventual best C’Thun deck, but it doesn’t look anything like the oppressive terror that double combo once was. This 3/3 with a Whirlwind attached has helped Warrior players compensate for the loss of Death's Bite. After surviving the heavy-handed nerf to Warsong Commander somewhat unexpectedly, most top Patron players felt like the loss of Death’s Bite would be the final nail in the archetype’s coffin. Thankfully for my fellow Patron enthusiasts and I, our lord and saviour Crane has already made it work. The new list runs the outstanding Blood to Ichor, Ravaging Ghoul and a single copy of Wild Pyromancer to make up for the loss of Death’s Bite—and it turns out the deck is still immensely powerful. Crane managed to secure a top 25 finish on two servers with the deck on the last day of the season, and it only promises to improve with refinement. It’s possible that the deck is simply preying on an unrefined meta right now, and will reduce in power as other decks firm up, but for now it seems like a beast, and remains one of the biggest stumbling blocks for those players who are trying to terrorise the ladder with Aggro decks. Zoo always perseveres. There’s a certain school of players that when asked what will be the best deck in any given format will answer without fail: “Probably Zoo, it always is”. The strategy of the deck is just too pure, too clean, and too effective to really suffer from any changes to individual cards or new set themes. As long as there are cheap, efficient minions in the game, Zoo will always work because they simply draw creatures on curve more consistently than any other deck possibly can. Some people may have felt that Zoo had had its day with most of its best early-game cards rotating out of Standard, but that was never going to be the case. Special mention should go to the insane Darkshire Councilman, which surprised pretty much everybody and is already being labelled the new Undertaker. Board clears are scarier now for Zoo players since they don’t have effective ways to play around them, but the amount of immediate refill in the deck has increased if anything. That’s thanks in no small part to the fantastic, instant board flood of the Forbidden Ritual spell, which Firebat argued might even be more powerful than Imp-losion thanks to its late game flexibility. 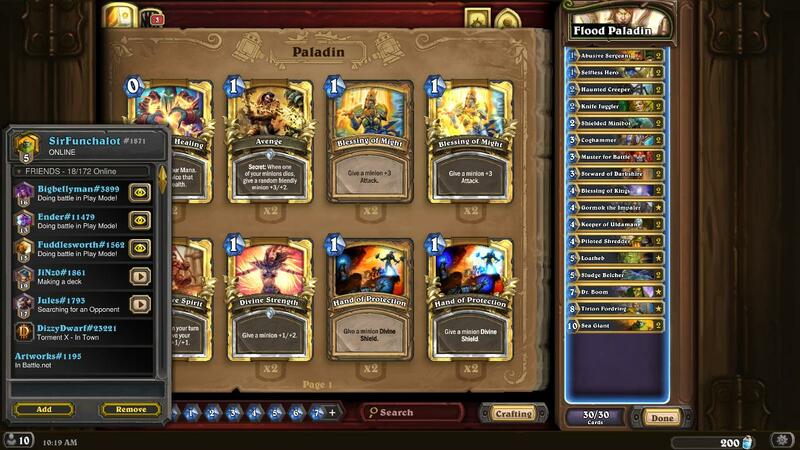 Remember all those annoying Paladin decks you used to face? Well, in Wild they're now running this thing with Muster for Battle. Ugh. Throughout my first day of playing Standard I kept changing my mind on what the most broken thing in Wild would be. Patron with Death’s Bite? Divine Shield Aggro Pally with Minibot and Muster? Zoo with Deathrattles and Implosion? It was hard to decide. Out of of morbid curiosity I fired up a game or two to try and find out and… Well, it’s scary in there, guys. If you plan on playing some Wild you will need to make sure that your deck feels unbeatable, because everyone else’s will be too. Make sure you’re equipped with a comfort blanket and a stress ball while you’re at it. A further thought on the Arena mode, which also uses the Wild format, and is a pretty trying experience at the moment. Both of these metas will probably take more time to stabilise than Standard where the majority of players are already hard at work trying to refine what works best, but I’ll be fascinated to see where Arena and Wild end up.